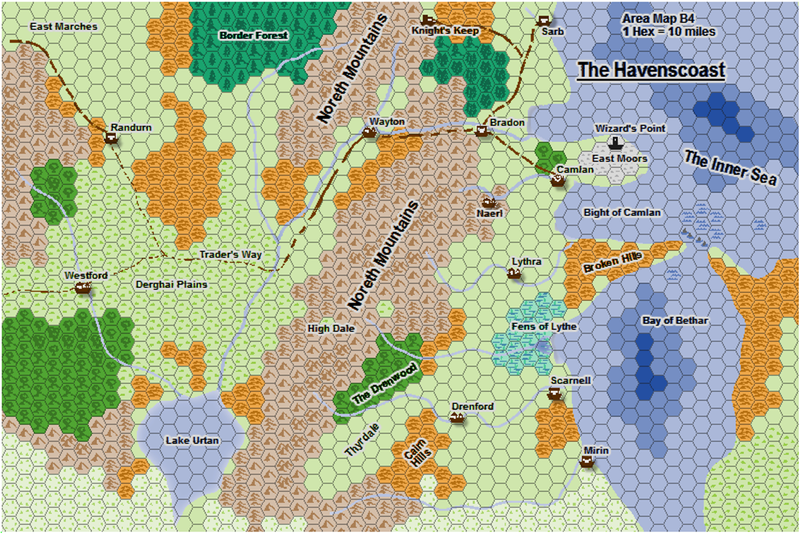 Recently, as part of the RPG Bloggers Carnival for April, I posted about the maps I used to create by hand many years ago, and the complex organisation system I developed. Most of the maps I shared were from a specific area (World Map 1; Area Map B4!) of my home-brew world, Tolrendor, known as the Havenscoast. To create that post, I had to delve through reams of my old notes, which was great fun. This material was all created over twenty years ago, so I decided it would be a cool idea to update it all, both by re-drawing the maps using Campaign Cartographer 3 (CC3), my mapping software of choice, and by updating to 4E Dungeons and Dragons, the current rule-set I’m using. In the interests of achieving something, I’m going to (initially) constrain myself to this particular area, and I’m going to concentrate on previously created material. This is not necessarily a direct conversion however, as I’m going to re-flavouring some aspects of the world in 4E style. I’m not setting myself any timescale targets either, but hopefully I’ll be posting on this project once a week. I look forward to creating and sharing further maps and material as the project develops!! This entry was posted in 4E D&D, Cartography, D&D Nostalgia, Self-publishing, The Havenscoast Project, Tolrendor Gazetter, World Building. Bookmark the permalink.